12 sheets of 50-55 gsm origami paper that has been cut to a square 20x20 cm format. 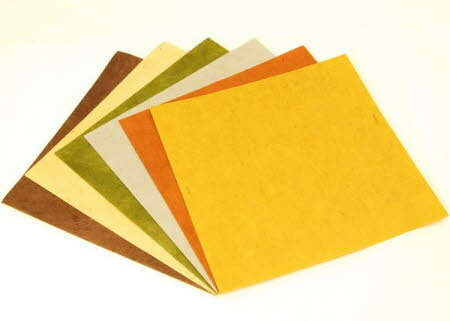 This selection pack is made up of 2 sheets of 6 different papers – chocolate, camel, lichen, pewter, terracotta and spice. Made from the bark of the Lokta bush, this handmade origami paper provides stiffness and durability whilst being flexible, soft and exceptionally strong. It provides a silky texture that can be used to imitate the fur of an animal to perfection and the long paper fibers give excellent strength for creases. The papers made from Lokta are resistant to water and can be used for wet folding. Sheets of lokta origami paper can also be coloured with water soluble dyes or printed with patterns or messages in a computer printer that can be worked into the origami design.